It’s Christmas tomorrow!!! I can’t wait for it. 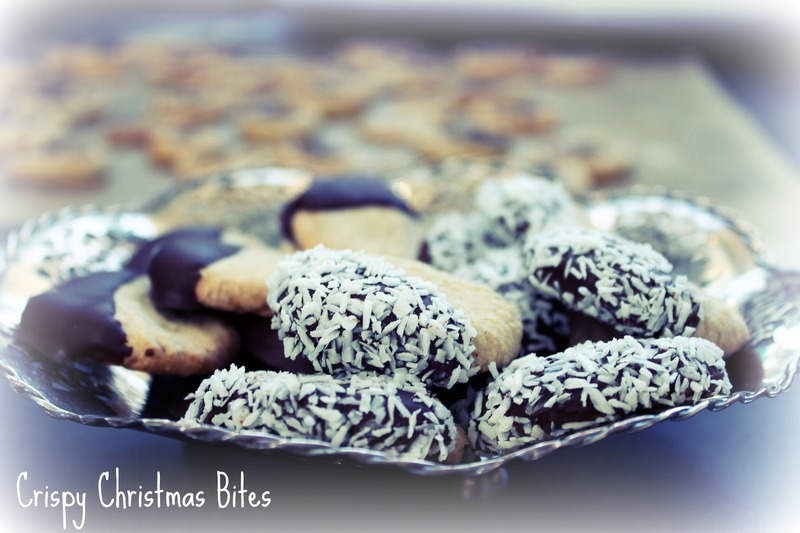 For the last pre-christmas Munch my Monday edition I will give you the last cookie recipe of the year. Today it will be simple and short as I have so much things to do! Gift wrapping, cleaning, working out… just to name a few things. Form a roll with your fingers and cut into small pieces of the desired size. If you love coconut as much as I do you can dipt the chocolate covered part of the cookie in some shredded coconut when the chocolate has already cooled but is not really firm yet. Delicious! These cookies are easy and extremely yummy. Okay my dears I will hitch up my knickers now and make my apartment pretty for Christmas. So looking forward to tomorrow. My presents are already lying under the tree and my husband got me four things 😀 I am soooooo curious! Hope you have a fantastic day! Tomorrow is Christmas finally! Hooray! Hope you’re having a great Christmas! These cookies look wonderful. Thank you! I really had a good time. I hope you too! Any more munch my Monday linkups?